Today we are happy to report we've hit a few more milestones. Now, here are two more reward videos. You won't see us in these, but you'll hear us. The first one is from a 2008 trip to Victoria Falls in Zambia. Baboons have free reign of the park area. The second video is from our recent Disney trip of the train village in Germany. Enjoy! 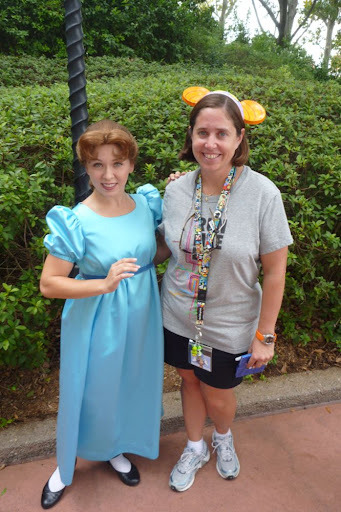 According to the order of pictures in my directory we went to the Studios this morning. Each trip to Disney's Hollywood Studios starts with the death march to Toy Story Midway Mania. Dave has a system to walk with cast members that puts him in the fast pass line ahead of most. This time Holly filmed the march and we've determined it's just as stressful to watch as it is to participate. In the end, we got our fast passes, rode the ride, went onto the Sunset Blvd attractions, then Star Tours (we've now viewed all scenes). The park crowds were light today so we took it easy and spent time with the characters in the Animation Academy. Today was threatening rain so there were more characters hanging out in here than usual. And they were bored. Goofy was playing one of the computer games. First, we visited with Pooh. He was the feature character at this time due to his movie. 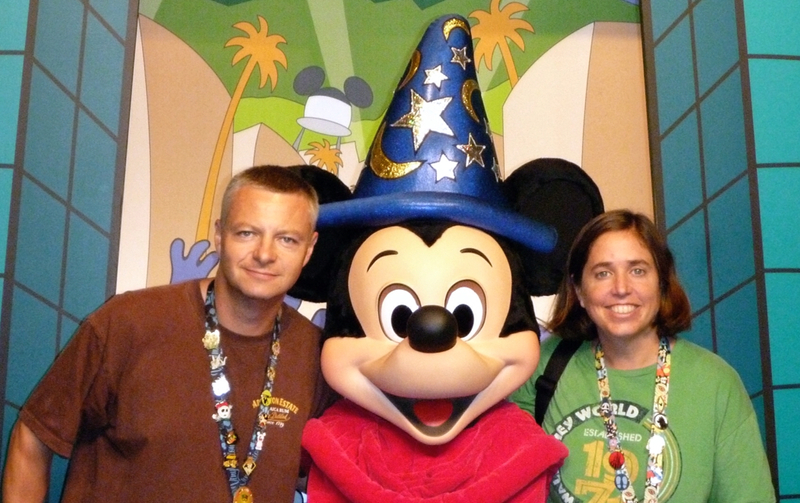 Got to check something else off the list: a visit with Sorcerer Mickey. Lunch today was at Sci-Fi Drive-in. You sit in cars and watch a loop of B-movies from the 50's. Bad films but entertaining. The food was lackluster today - we both had burgers. Very salty. 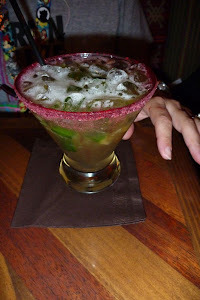 The glowing margarita was very good. Not sure what else we did here today. We walked back to The Boardwalk before heading to Epcot. This was the day of our cheese deminar. The deminar ended around six. The plan was dinner around the World Showcase at Festival booths and see one set of Sugar Ray. We did manage to hit a few booths before the rain came. Hawaii was a new booth this year. 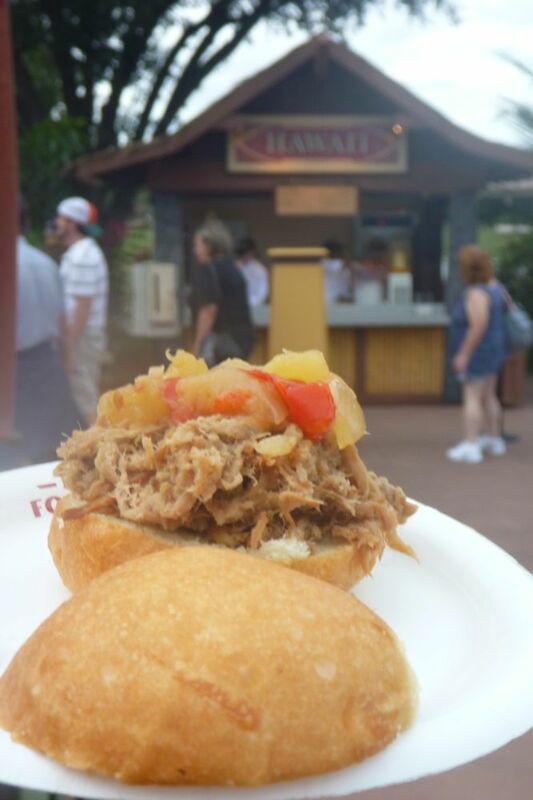 We tried the pork slider with pineapple chutney. We skipped the spicy mayo since Dave does not do mayo. This was very good even without the mayo. The Pipeline Porter (also featured over at the Poly) was very good on draft. We'd like to find that one around us in Illinois. Canada was our next stop for our favorite item, the chicken chipotle sausage with sweet corn polenta. Everything works here with the spicy sausage, creamy polenta, sweet onions and peppers. We ate a few of these during the week. Ireland is where you can get the popular Fisherman's Pie. We have to say it was better in other years, but still good. 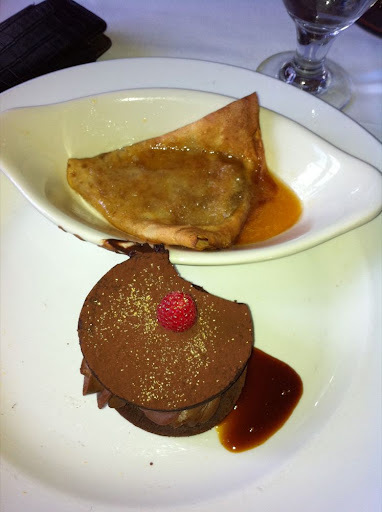 We also sampled their cheese platter and chocolate cake on another trip into the fest but didn't take a picture. Both were very good. After picking up the pie the rain started to come down. We ducked into the Rose and Crown Pub to wait it out. We got a bit of a break after 20 minutes and went for it. As soon as we got to the France Booth it kicked back in again. Escargot and coq au vin were water-logged. We ate them on a trash can inside the pavilion where the movie lets out. We milled around in stores for a while then the rain stopped. We caught the last Sugar Ray set from the third row. We weren't "excited" to see Sugar Ray, but many people were. We couldn't name more than one hit before the set started, but then realized they had a string of big songs for a while. They were entertaining to watch and Mark (the lead singer and guy from Entertainment Tonight and the show where people gotta remember song lyrics) seemed into it. But boy did he sweat. The people in front of the little outcrop stage had to have been soaked. We must have eaten something else because tonight was supposed to be dinner around the festival. We have no photgraphic proof though. Oh well..... We caught Illuminations from the front of World Showcase Plaza. This is where the show was designed to be viewed. It was just sooooo close. We left the park and headed to Jellyrolls. It was just an off-night there. The songs, crowds, performers just weren't that entertaining. 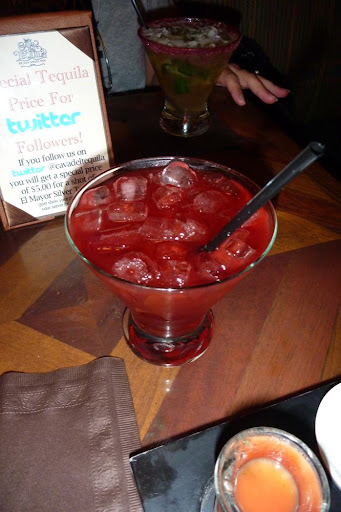 We headed over to Atlantic Dance Hall and enjoyed a nightcap from the outdoor seating area. We left our first day of Food & Wine to go back to the Boardwalk for a quick drink on our room's balcony and a wardrobe change. We met friends for dinner and drinks at The Grand Floridian. Cocktails first at Mizner's then dinner at Citricos. We had a great meal and lots of fun with our friends. 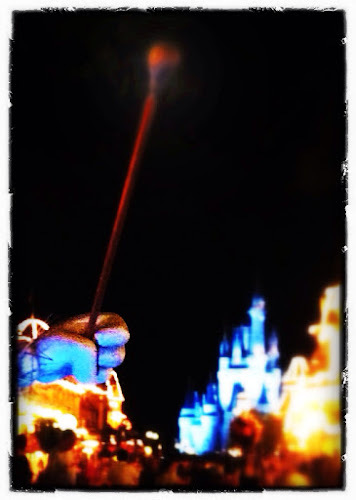 After dinner we headed off to the Magic Kingdom for Wishes! Our friends returned home. 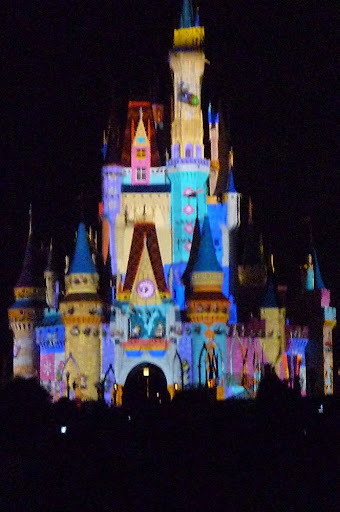 We arrived about 10 minutes before the Magic, Memories, and You light show. We were able to work our way pretty close to the hub. 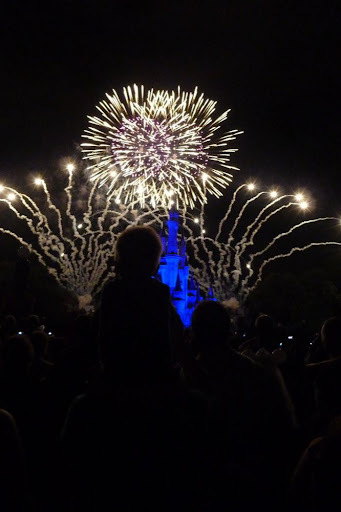 While this isn't the best night time show we've seen, it's a good way to occupy time while waiting for Wishes! (the fireworks show). We thought since it was Extra Magic Hours that we'd hit some rides. Other than the TTA it didn't happen. The park was just crowded. We decided to call it a night and head back to The Boardwalk to enjoy some time at Bellvue Lounge. When we got to the lounge it was a bit crowded and most of the folks seemed to have D23 shirts and event tags (D23 is the official Disney fan club). We realized they just wrapped up the Sip & Stroll event. To avoid the crowd we went to the outside balcony. While sitting outside we had a view into the lounge and the corner table. We looked at the crew in there and then both realized at the same time "that's Bob Gurr". 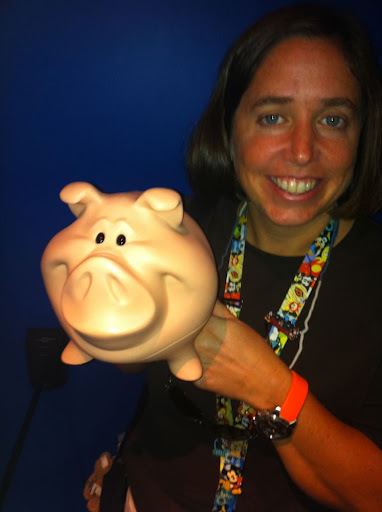 Oh, and he's with Steven Clark the head of D23. This is how you know you are a Disney Geek. Bob Gurr is "the man". He gave the parks a lot of their unique character from the design of the monorails to the cars that run up and down Main Street. We noticed Bob's drink was empty and he was getting up. We decided to pounce! We went back into the lounge and sat at a table that would be in his direct escape route. He approached and we sprung up. We talked for a few seconds then asked for a picture. He was so nice and agreeable. He took us back to his table and had Steven take our picture. We talked to Steven (whom offered us a drink but we graciously declined) and danced around why we didn't go the Sip and Stroll Event. In truth: It was a 2 day commitment that would have cost us around $400. Bob left and came back a few minutes later. Apparently we interrupted an 80 year old man's bathroom break. Ooops! 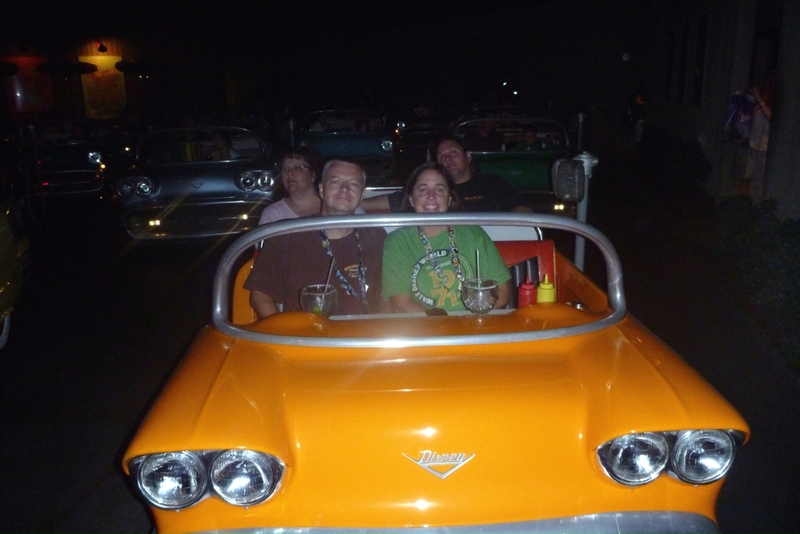 We also learned that Bob drinks Side Cars. Dave didn't get it at first. We found a couple bar seats were now empty and sat down to enjoy more drinks. About 15 minutes later Allen, the bartender, comes from the balcony and brings us our park bag containing video camera, Vinylmations, annual passes, pin lanyards, etc. Yeah we're morons that got caught up in the moment. P.S. 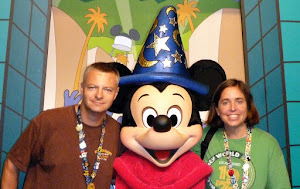 When we got home we found out that Bob was interviewed that week by the Waltcast podcast. It's an hour conversation with him that's a fun listen. Today's post is a bit more visual. Here are some sights and foods from Epcot's Food & Wine Festival. Please note we did not get a picture of everything we ate. Totally forgot sometimes (like the greek cheese) or the food was water-logged from a downpour (like the coq au vin we ate on a trash can inside Impressions of France building). 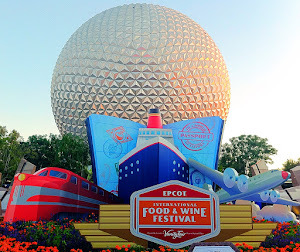 We're using the Disneyfoodblog to help jog our memory and give you a link-back on specific booths for more details and see other offerings. There will be more to come in future posts (linking them through the epcotfw tag on the right sidebar). 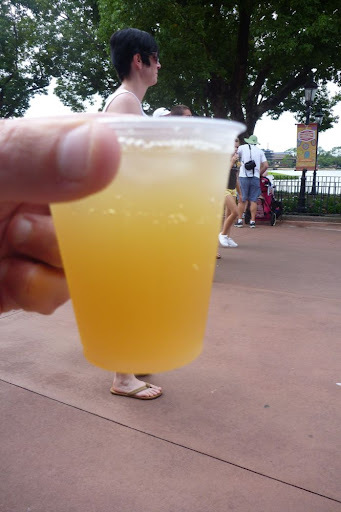 The "craft" beer pavilion was at the start of World Showcase coming from Future World. This was not so much a craft beer stand as it was a "kinda good" regional big brewery booth. Leinie's and Blue Moon are made by Miller. They could have done better here. Next year they should consider the beers of Colorado. Australia had a few decent items. Shrimp on the barbie and lamb chop. We're not big fans of lamb, but it was pretty good. 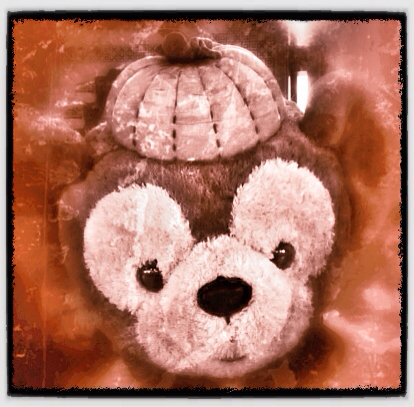 Had to stop and say hi to Duffy. Thank goodness he changed his outfit (see this June post for that comment's backstory). From Brazil: Seared Mahi Mahi with steamed Rice, Hearts of Palm, and Coconut-Lime Sauce. It was good, but looks prettier on Disneyfoodblog. Our piece got kinda chopped up. Argentina had the best empanada we've ever eaten. Moist, beefy, cheesy, crispy. They got this one right. The beef with chimichurri was good as usual. This trip Holly discovered she liked malbecs. Mexico: rib-eye taco one of our favorites this year. We had a few of them, as well as the shrimp. Since Dave has adversities to mayo and mayo-like liquids we got the shrimp one dry first time, then as-suggested later trips. So all that was before noon. 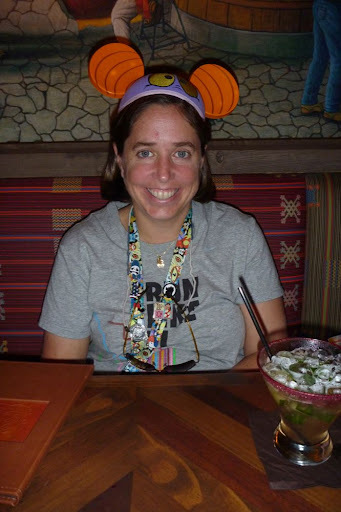 Now to one of our favorite places in WDW: La Cava Del Tequila. Small little place to relax and have great margaritas. Dave had the hibiscus margarita (red) and Holly had the jalapeño margarita. During the festival they had a special for twitter followers. You got a $7 shot for $5. Dave likes good-quality sipping tequila so we got this. 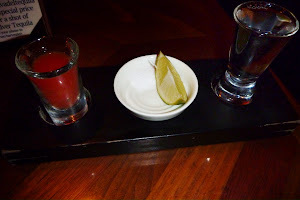 It was El Mayor Blanco served with sangrita, fresh lime and salt. Fun! Scandinavia was new this year and we tried two things. We tried the Swedish meatballs (they were good). Also tried the Xante Sunshine cocktail. Xante is described as a pear liqueur and was mixed with juice. we describe it as ick. Not a repeat. China was our next stop. We had some items here in prior years and found it hit-or-miss. This year we had the Black Pepper Shrimp with Sichuan Noodles. Good, but not great. Off to South Korea. 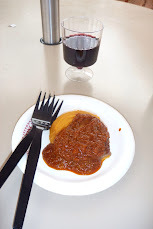 Here we tried the beef dish and "new" raspberry wine. The beef itself was good, but the cabbage side was nasty. Pickled cabbage. Really? 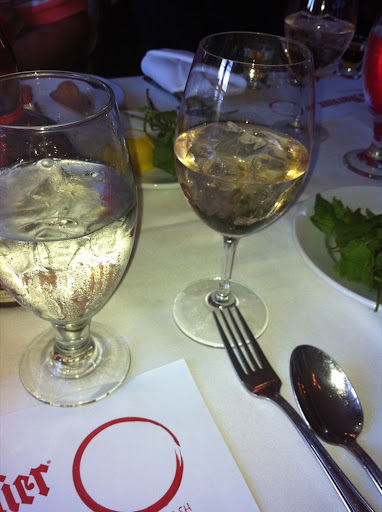 The raspberry wine was the consistency of port with an off-flavor. Made us want the old raspberry wine. We had the tenderloin with braai sauce and smashed sweet potatoes from South Africa. They've had the dish the past few years and it's one of our favorites. We got a pinotage to go with it. Germany was our next stop. We were a bit upset the spaetzel was gone this year. We heard the strudel was good so we tried that and the sausage on a pretzel roll. Didn't like either. Sausage was salty and strudel just too much fruit. Too "strudely"
Ran into this guy. He's a party. 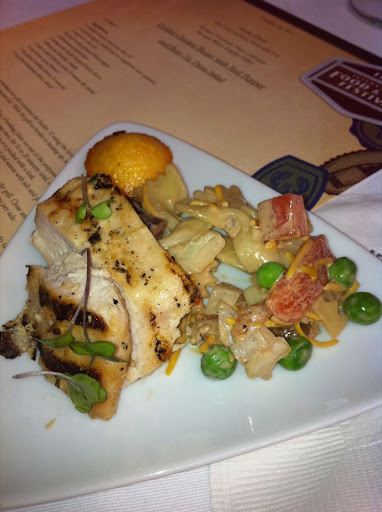 The final food of today's post is from Hops and Barley. They had two lobster offerings: a lobster roll and lobster claw. Couple these items with Sam Adam's beer, including a festival exclusive, you have a winner. Last year's lobster roll was full of minced meat, celery, etc bound with a pint of mayo. This year it was all meat and a touch of spread. The claw was delicious. On one occasion Dave spilt the cup of butter all over his shorts. Oops! Is There Such a Thing as Too Much Epcot? From this point on, we were in Epcot everyday for some portion of the day. It seems pointless to give the day-by-day blow for the Epcot portions of the trip. We'd repeat phrases like "...sat in La Cava de Tequila", "watched Off-Kilter...", "...Chicken sausage from Canada" way too much. We'll split this up into a couple of posts. 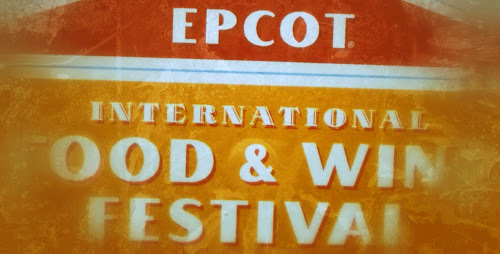 It's Food & Wine Festival. 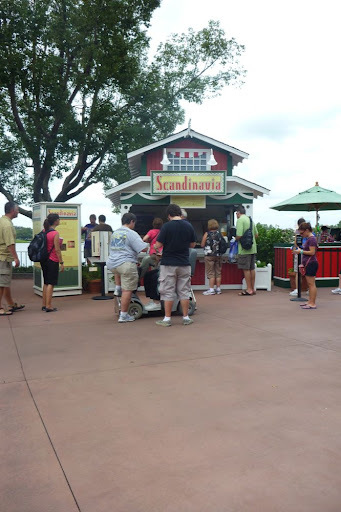 For several weeks Epcot has over 25 additional food and drink booths around The World Showcase. 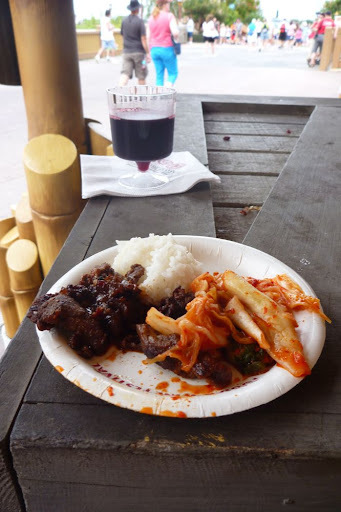 In addition, there are culinary seminars, special lunch and dinner events, and 3 sets nightly from a headliner music act. The whole low-down is listed at Disneyfoodblog.com. This is our favorite Disney event. On three occasions we came into the park at opening time (called "rope-drop"). 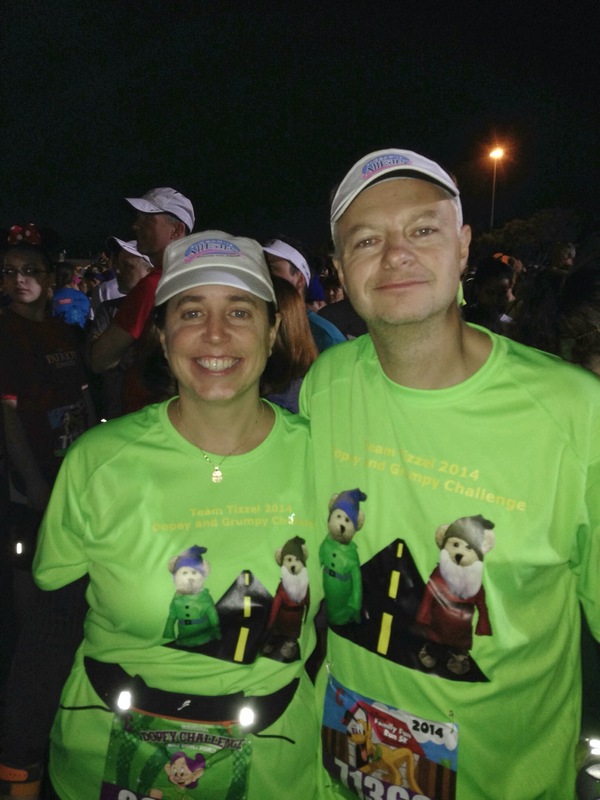 For us that meant walking really fast (never run) from International Gateway (by England) to Future World. For three days we were within the first dozen on line for respective attractions: Soarin',Epcot's Character Spot, Soarin'. Yep, we burnt Power Hour time on character lines. In total, we spent about 6 hours at Future World attractions. 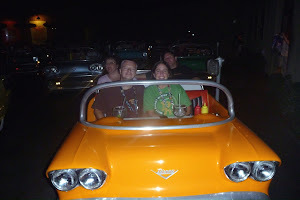 On this trip Future World was there to kill time before World Showcase opened. One of the features of the Festival this year was Ocean Spray's Cranberry Bog. In some early photos this looked huge. In real life not so much. Not sure we'd wanna stand there all day. Since we had ample time this trip we went to a couple deminars: demonstrations/seminars. 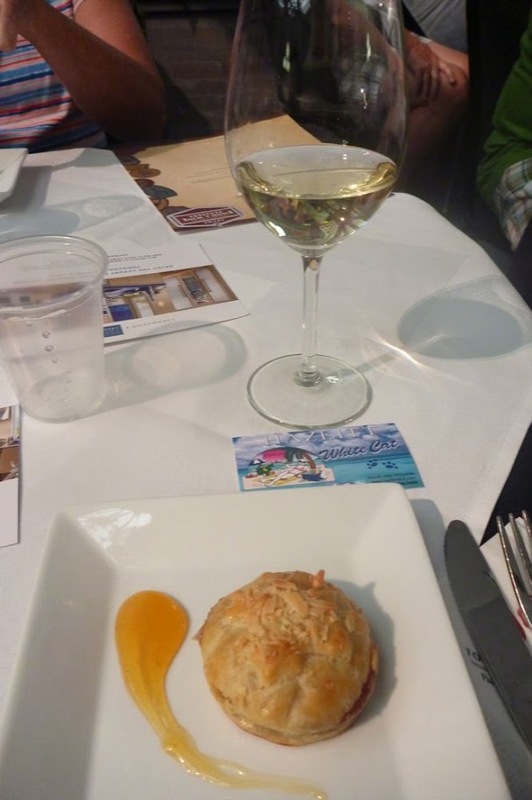 These were around $12pp and you got a glass of wine and featured food item you learned how to cook. 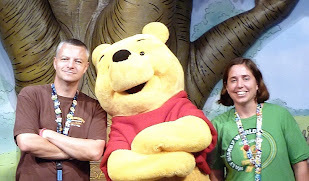 Our first one was will Bill Clark, Grand Floridian Pastry Chef. When we signed up it indicated it would be a cheese dish, which it was......but we were thinking cheese plate. Ended up being baked brie in a puff pastry. Nice. 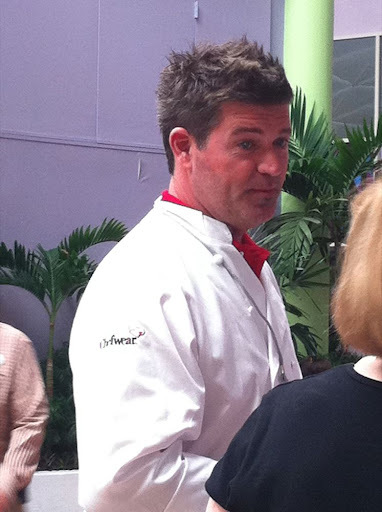 A few days later we went to Jamie Deen's seminar on chicken. He's Paula's son. He was very entertaining and actually walked through the line to say hi to folks before the demo. Nice guy. 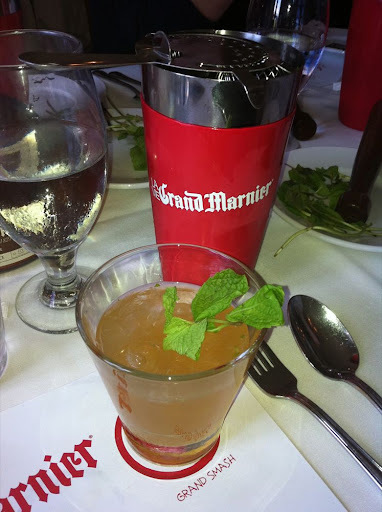 We also attended one special dessert/cocktail event called “Taste, Shake, and Indulge Like the French: Grand Marnier Tasting and Interactive Experience” . This event was $55pp. 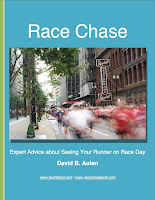 Dave describes the event as a "chance to watch older folks get looped after having a glass of champagne, 3 shots, and a cocktail in 20 minutes". The host, a French lady, was entertaining, but at times we felt truly regarded the group as ugly Americans and told us to leave our country more often. Dave liked everything, Holly did not enjoy the traditional "cheaper product". We loved the Moët Ice Imperial and had a friend bring us a bottle last week since we couldn't fit one in our luggage. Next up we'll explore some of the food and drink from the festival booths. "I Can Tell We're off to a Great Start"